Act! 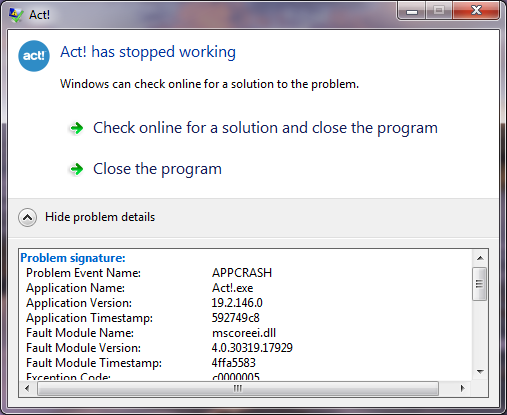 has stopped working - APPCRASH - mscoreei.dll - Twelve/Three Marketing, Inc.
It’s always ‘fun’ to encounter a new Act! error, just when you think you’ve seen it all. I ran into this one today, on August 8th 2017. This occurred after running some Windows security updates. This particular machine was Windows 7, 64-bit, running Act! version 19.2 Premium Update 3. APPCRASH Error message shown when trying to open Act! mscoreei.dll is a file related to the Microsoft .NET Framework. Note: Your version of .NET may be different. It is very possible you are using 4.0, 4.6, or 4.7. Or something else entirely. When I encountered this error, it was 4.5. Run the Repair utility on the .NET framework. It may take a few minutes. Reboot the computer when finished and test. As always, you can email support@twelvethree.com if you would like to hire us to take a look at it. Hope this helps! Best of luck out there. This entry was posted in ACT! Quick Trick and tagged ACT, error, mscoreei.dll, v19. Bookmark the permalink.